Adam Joseph Copeland (born October 30, 1973 in Orangeville, Ontario) is a Canadian actor and retired professional wrestler. 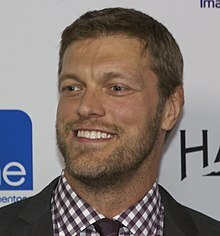 He is sign to WWE smackdown brand where he wrestled under the ring name Edge. He was forced into early retirement from professional wrestling due to a injury to his neck. Copeland was inducted into the WWE Hall of Fame on March 31, 2012 by his best friend and tag team partner Christian. Since retiring, Copeland has regularly appeared on the Syfy series Haven where he plays the character Dwight Hendrickson. He was ranked #2 on the top PWI 500 singles wrestlers of 2007. 1Edge won the championship during the Invasion storyline. Copeland, Adam (2004). Adam Copeland On Edge. World Wrestling Entertainment Books. ISBN 978-1-4165-0523-5. ↑ 1.0 1.1 "IGN: Edge (WWE) Biography". IGN. Retrieved 2008-01-01. ↑ "Christian Cage bio at SLAM". SLAM sports. Retrieved 2008-08-27. ↑ "ICW Street Fight Tag Team Title". ProWrestlingHistory.com. Retrieved 2014-10-29. ↑ "News: Edge to join second Hall of Fame". Pro Wrestling Torch. Retrieved 2014-10-29. ↑ Pro Wrestling Illustrated 33 (3): 103. 2012. ↑ 13.0 13.1 Pro Wrestling Illustrated 33 (3): 99. 2012. ↑ 14.0 14.1 Pro Wrestling Illustrated 33 (3): 98. 2012. ↑ Pro Wrestling Illustrated 33 (3): 101. 2012. ↑ Pro Wrestling Illustrated 33 (3): 102. 2012. ↑ "Pro Wrestling Illustrated (PWI) 500 for 2007". The Internet Wrestling Database. Retrieved 2014-10-29. ↑ "WWE Championship - Edge (January 08, 2006 - January 29, 2006)". WWE. Retrieved 2014-10-29. ↑ "WWE Championship - Edge (July 03, 2006 - September 17, 2006)". WWE. Retrieved 2014-10-29. ↑ "WWE Championship - Edge (November 23, 2008 - December 14, 2008)". WWE. Retrieved 2014-10-29. ↑ "WWE Championship - Edge (January 25, 2009 - February 15, 2009)". WWE. Retrieved 2014-10-29. ↑ "World Heavyweight Championship - Edge (May 08, 2007 - July 17, 2007)". WWE. Retrieved 2014-10-29. ↑ "World Heavyweight Championship - Edge (December 16, 2007 - March 30, 2008)". WWE. Retrieved 2014-10-29. ↑ "World Heavyweight Championship - Edge (June 01, 2008 - June 30, 2008)". WWE. Retrieved 2014-10-29. ↑ "World Heavyweight Championship - Edge (February 15, 2009 - April 05, 2009)". WWE. Retrieved 2014-10-29. ↑ "World Heavyweight Championship - Edge (April 26, 2009 - June 07, 2009)". WWE. Retrieved 2014-10-29. ↑ "World Heavyweight Championship - Edge (December 19, 2010 - February 18, 2011)". WWE. Retrieved 2014-10-29. ↑ "World Heavyweight Championship - Edge (February 18, 2011 - April 15, 2011)". WWE. Retrieved 2014-10-29. ↑ "United States Championship - Edge (November 12, 2001 - November 18, 2001)". WWE. Retrieved 2014-10-29. ↑ "Intercontinental Championship - Edge (July 24, 1999 - July 25, 1999)". WWE. Retrieved 2014-10-29. ↑ "Intercontinental Championship - Edge (August 19, 2001 - September 23, 2001)". WWE. Retrieved 2014-10-29. ↑ "Intercontinental Championship - Edge (October 21, 2001 - November 05, 2001)". WWE. Retrieved 2014-10-29. ↑ "Intercontinental Championship - Edge (November 18, 2001 - January 20, 2002)". WWE. Retrieved 2014-10-29. ↑ "Intercontinental Championship - Edge (July 11, 2004 - September 06, 2004)". WWE. Retrieved 2014-10-29. ↑ "World Tag Team Championships - Edge & Christian (April 02, 2000 - May 29, 2000)". WWE. Retrieved 2014-10-29. ↑ "World Tag Team Championships - Edge & Christian (June 25, 2000 - September 24, 2000)". WWE. Retrieved 2014-10-29. ↑ "World Tag Team Championships - Edge & Christian (October 22, 2000 - October 23, 2000)". WWE. Retrieved 2014-10-29. ↑ "World Tag Team Championships - Edge & Christian (December 10, 2000 - December 18, 2000)". WWE. Retrieved 2014-10-29. ↑ "World Tag Team Championships - Edge & Christian (December 21, 2000 - January 21, 2001)". WWE. Retrieved 2014-10-29. ↑ "World Tag Team Championships - Edge & Christian (March 19, 2001 - March 19, 2001)". WWE. Retrieved 2014-10-29. ↑ "World Tag Team Championships - Edge & Christian (April 01, 2001 - April 19, 2001)". WWE. Retrieved 2014-10-29. ↑ "World Tag Team Championships - Hollywood Hogan & Edge (July 04, 2002 - July 21, 2002)". WWE. Retrieved 2014-10-29. ↑ "World Tag Team Championships - Chris Benoit & Edge (April 19, 2004 - May 31, 2004)". WWE. Retrieved 2014-10-29. ↑ "World Tag Team Championships - Chris Benoit & Edge (October 19, 2004 - November 01, 2004)". WWE. Retrieved 2014-10-29. ↑ "World Tag Team Championships - Edge & Randy Orton (November 13, 2006 - January 29, 2007)". WWE. Retrieved 2014-10-29. ↑ "World Tag Team Championships - Edge & Chris Jericho (June 28, 2009 - July 26, 2009)". WWE. Retrieved 2014-10-29. ↑ "WWE Tag Team Championships - Edge & Rey Mysterio (November 07, 2002 - November 17, 2002)". WWE. Retrieved 2014-10-29. ↑ "WWE Tag Team Championships - Edge & Chris Jericho (June 28, 2009 - July 26, 2009)". WWE. Retrieved 2014-10-29. ↑ "Edge vs. Kurt Angle: King of the Ring 2001". WWE. Retrieved 2014-10-29. ↑ "Full WrestleMania 21 Results". WWE. Retrieved 2014-10-29. ↑ "Edge wins 30-Man Royal Rumble Match". WWE. Retrieved 2014-10-29. ↑ "Edge Gets Inducted Into WWE's Hall of Fame: April 2, 2012". WWE. Retrieved 2014-10-29. ↑ "Slam, bam, thank you ma'am!". WWE. Retrieved 2014-10-29. ↑ "Saluting the Slammys". WWE. Retrieved 2014-10-29. ↑ "Team SmackDown def. Team Raw (WWE Bragging Rights Tag Team Elimination Match)". WWE. Retrieved 2014-10-29. ↑ 56.0 56.1 56.2 56.3 Meltzer, Dave (January 26, 2011). "Biggest issue of the year: The 2011 Wrestling Observer Newsletter Awards Issue". Wrestling Observer Newsletter (Campbell, CA): 1–40. ISSN 1083-9593. Wikimedia Commons has media related to Adam Copeland. This page was last changed on 1 December 2018, at 08:22.